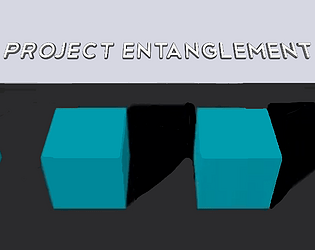 A puzzle game prototype where one object can be in two places at the same time. I worked on this project on and off for a year or so. Most of the work I did went into the design, but the programming took longer than it should as well. I finally finished the prototype at the end of December. Well thought out puzzles! I especially liked the ones with the entangled player, the one with 6 drag blocks. A few QoL improvements, and a visual overhaul and I could see this being a great full fledged game. Things like if there are multiple objects that have different entanglements, maybe color code the ones that are linked. Anyways I had fun all the way through. This is pretty cool concept. Loved the puzzles. Great job!. I feel like movement can be improved, pressing a button every time to make the player move one block was a little bit annoying. thanks! This is mostly a proof of concept, so the movement will definitely be improved a lot before it's done.